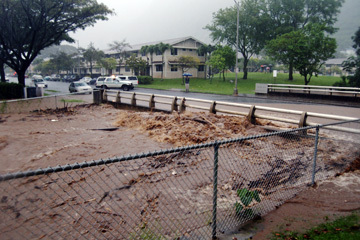 Kang Chong waded through the intersection of Fern and Hauoli streets yesterday to take photographs. The flooding was made worse when the canal that channels Makiki Stream overflowed its banks at Fern and Punahou streets. A midday downpour thundered over Honolulu yesterday, overwhelming an area already saturated from six weeks of rain. Homes and businesses were inundated, roads were closed, mudslides threatened homes and Kahala Mall was flooded out for the weekend. » 1. Residents living near overflowing Waimanalo reservoir are advised to leave their homes, but many stay. About 36,000 gallons of partially treated sewage spills from the Waimanalo Wastewater Treatment Plant. » 2. An unknown amount of untreated waste water spills from a main that feeds the Kaneohe Pretreatment Facility, and enters Kaua Stream. » 3. An Anonia Place man watches a mudslide go over his retaining wall and covers three-fourths of his back yard. » 4. A man watches over his parents' home on Hao Street. The home has sunk about 3 feet because of the wet weather and threatens a lower neighboring house. » 5. Floodwaters swamp Kahala Mall, forcing the closure of the regional shopping center for a few days. » 6. Water runs off at Puuhonua Street, and emergency workers keep a nervous eye on Manoa Stream, which rose 8 feet. » 7. Makiki Stream overruns its banks and forces the closure of Kalakaua Avenue. Every surface street from Kalakaua Avenue to McCully Street is flooded. » 8. 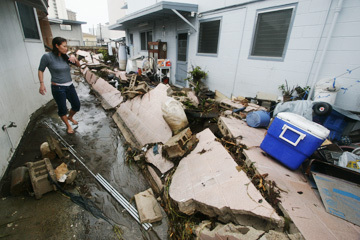 Moku Place near Keeaumoku Street and Wilder Avenue floods, damaging ground-level apartments and cars. » 9. About 30 people are forced to leave their Maunalaha Road homes on Round Top after a 200-foot-long chasm, as wide as 20 feet at some points, opens. » 10. A small landslide comes from the mountains in Moanalua Valley near an Ala Lani Street home. The resident is advised to leave but stays. The torrential rains flooded major thoroughfares, overflowed the Manoa and Makiki streams, and knocked out phone service for many East Oahu residents. The rain also overwhelmed waste-water treatment facilities in Kaneohe and Waimanalo, sending thousands of gallons of untreated waste water into Kaneohe Bay and around the Waimanalo plant. Sewage spills were also reported at Manoa, Kakaako, Enchanted Lake, Kailua Heights and Aliamanu. The heavy rains closed Hanauma Bay, the Honolulu Zoo, Foster Botanical Garden, the Kaneohe District Park swimming pool and all city golf courses except Kahuku. While the rain hit the entire island, it was the southeastern corner of Oahu -- from Makiki to Waimanalo -- that bore the brunt. "It happened to be our turn on Oahu today," Pete Donaldson, National Weather Service forecaster, said yesterday. All the islands have had their turn during the rainy weather system that has plagued Hawaii since Feb. 19. And all islands remain under a flash flood watch today. Donaldson could not say where the next heavy rains will hit. "It's been hard to say exactly when the heavy rains are going to end," but they should last at least through the weekend, he said. 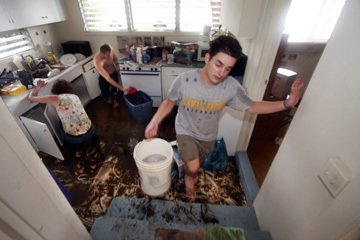 Yesterday's midday deluge hit Makiki, McCully, Manoa and Kahala particularly hard. 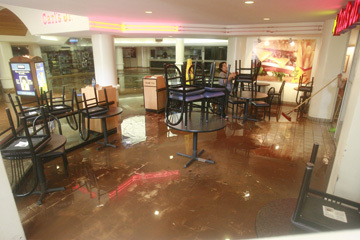 Shops at Kahala Mall were shut by what some described as a "river of water" coming down Hunakai Street. "It was so scary, the water was coming up so fast," said Kahala Barber & Hair Salon owner Marion Oki. "We cannot open shop, the water was about 4 inches high inside. It was real bad, and I think we got the worst of it." At the intersection of Keeaumoku and Wilder streets, motorists plowed through about two feet of water, and police closed down Kalakaua Avenue because Makiki Stream overflowed, filling nearby areas with mud and debris. "We sandbagged our doors but the whole street got hit," said Jerry Washington, a worker at Mopeds Plus on Kalakaua Avenue. "A lot of mud and water everywhere." Almost every surface street between Kalakaua Avenue and McCully Street was flooded, while large branches and other debris floated down streets as far as Daiei Kaheka. Water shot out of manhole covers everywhere, while passing vehicles caused min-tsunamis as pedestrians screamed at drivers. "SLOW DOWN!" yelled an elderly man walking along Kaheka Street while shaking his fist at a passing SUV. "I've never seen it like this," said Alan Watari, a McCully resident who watched as cars and trucks and people moved slowly in thigh-deep water in front of his home along Hauoli Street. "We've lived here for three years, and it's never been this bad." That sentiment was expressed throughout the island. The areas hardest hit during yesterday's storm that swamped Oahu. Rainfall totals are from 11:45 a.m. to 2:45 p.m., recorded at the nearest National Weather Service rain-guage station in the area. East Oahu » 3.04 inches » Niu Valley | Kahala Mall, left, was evacuated and closed due to flooding. 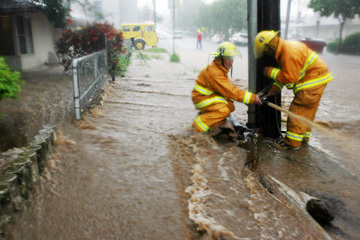 Mudslides threaten homes. Sewage spills in Waimanalo. Makiki / Manoa » 2.79 inches » Lyon Aboretum | Makiki and Manoa streams overrun their banks, flooding homes and streets, including Woodlawn Drive, left. Landslide causes evacuation of Maunalaha homes on Tantalus. 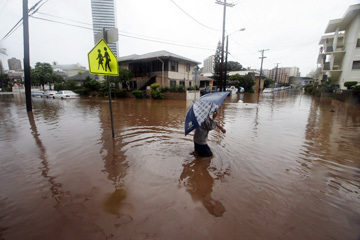 Honolulu » 2.64 inches » Palolo | Several feet of water cover neighborhoods in the McCully and Kalakaua areas. Keeamoku Street, left, was temporarily closed. When the skies opened up early yesterday afternoon, Niu Valley resident Peter Dye could sense something was up. "The volume of rain was incredible," he said. » This weekend's Honolulu Centennial Festival at Ala Moana Beach Park has moved to April 7-9. Next Friday and Saturday, the festival will run from noon to midnight; on April 9 it will run from 10 a.m. to 8 p.m. The festival is part of the City and County of Honolulu's 100th-birthday celebration. For more information, call 275-3030 or visit www.honolulupride.com. » The Hawaii Medical Service Association canceled its "Go Walk" festival at Ala Moana park today. It will not be rescheduled. » All Interscholastic League of Honolulu baseball and golf events have been postponed. » The beach park at Bellows Air Force Station is closed for the weekend. According to the weather service, Niu Valley was hit with 3.04 inches of rain from 11:45 a.m. to 2:45 p.m.
From the dining room of his Anonia Place home, he had a clear view of the mountain behind. He heard and saw a rock hit his retaining wall, which sustained little damage. But five minutes later he heard a rushing sound, and the mountain opened up, sending mud rushing toward his retaining wall, topping it and overflowing like fingers of lava reaching toward his house. "I have two young kids and immediately started grabbing things, thinking, 'This is it!'" said Dye. He rushed his children to his mother's house in Hawaii Kai and returned later when the rain subsided to assess the situation. Three-fourths of his back yard was inundated, with the mud as high as 3 feet against the retaining wall he had put in to keep rocks out, he said. Mixed in with the mud were rocks. "It's real scary right now, and I'm not sure what to do," he said. "I do not feel safe right now in that house." He planned on having his family stay elsewhere tonight. The downpour caused Manoa Stream to overflow its banks, running into Woodlawn Drive just like it did during the Halloween eve flood of 2004. "I don't remember seeing the water this high," said Danielle De Longe, who works at the Manoa Innovation Center and watched the stream rise more than eight feet before it lapped over the Woodlawn Drive bridge. Police closed off Woodlawn Drive for about an hour as the water continued down the road, leaving branches, stumps and other debris behind as it did two years ago. The Woodlawn bridge was the only place where the stream overflowed yesterday, unlike the 2004 flood where there were overruns in several areas causing millions of dollars in damage to homes, businesses and the University of Hawaii. In other parts of Manoa, Oahu Avenue and Manoa Road became a river of mud as the quick, heavy rain fell for nearly two hours. Torrents of water ripped through some homes on Oahu Avenue, but there were no reports of injuries. By 1:30 yesterday afternoon the waters had receded, and the police lifted roadblocks on Woodlawn Drive and several other streets, including segments of University Avenue. Police officers at the scene said they were grateful that Noelani Elementary School, which lies at the end of Woodlawn Drive, was on spring break. Didier Dumas carried water from a kitchen in a building at the same intersection. Helping clean are Monique Regis and her son, Stephane Regis. The Loo family had to flee their Hao Street home because weeks of rain has caused the earth to shift and drop, leaving the structure buckling and uninhabitable. "From the looks of the house, I would say probably not," David Loo said yesterday when asked if his parents would be able to move back in. The house was built in the 1950s. Loo said the serious problems began March 23 when rainwater flooded the family's yard and a front room of the house. Neighbors reported hearing a "pop" -- the sound of a manhole cover being blown out by the tremendous flow of water just before the flooding, he said. The next morning, the yard looked like a lake, and there was a fissure going across the property, where the ground had started to pull apart. "The rain hasn't stopped for weeks," Loo said. "Every day, it was getting worse." The family has received help from the American Red Cross and is now staying with relatives. Heavy rain caused flooding on and along Fern Street. Adding to the flooding was water in the canal that channels Makiki Stream, which overflowed its banks at Fern and Punahou streets. Renee Miyao inspected her wall that collapsed. She lives on the second floor of the building that is on Punahou Street near Fern Street. Overflowing water had rushed through where she is standing. Standing in ankle-deep water inside the family's carport along Moku Place, 15-year-old Brad Hironaga held his hand at waist level to show how high the water had been just a few hours earlier. It took firefighters about two hours to pump the water out of the street. By midafternoon, residents were left to hose the mud off their cars and driveways. Mud stained some cars well above the tires, indicating how deep the water had risen. Hironaga's older brother, Jin, was awakened by a friend at around 10 a.m., as the heavy rains swelled the drainage canal behind their home. "I looked outside, and the water was coming up inch by inch, really, really fast," said Jin, 18. "We were panicking. We didn't know what to do, so we just threw all the dry stuff on top of each other to try and make it so that nothing would get wet." Sue Keliipio, who lives in a third-floor apartment along Moku Place, was out helping neighbors clean up the mess left by the sludgy mud that covered the street about an inch deep. Although her building is on higher ground, neighboring buildings are not. In those buildings, water about a foot deep that still flooded ground-level units yesterday afternoon would have to be taken out by the "bucket brigade," she said. "It was terrible," said Keliipio, who has lived in the building for 15 years. "First time that I've ever seen it come up that much." Yesterday's deluge came a week after heavy rains caused similar flooding, but on a much smaller scale. "This was worse than last Friday," Keliipio said. "It was all the way up, nothing but mud and dirt." For the Hironaga brothers, both students at Kaiser High School, this week's spring break holiday was spent cleaning up from the minor flooding a week ago, only to see the effort go to waste in a few hours yesterday. "The whole floor, every inch of it, is covered in mud right now," Jin Hironaga said. "We just cleaned it and this just happened this morning, so we have to start all over again." 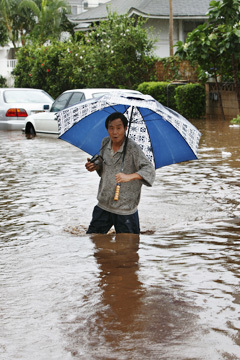 Kang Chong waded across a flooded Hauoli Street. The rain caused two sewage spills on Windward Oahu, one of which dumped an estimated 36,000 gallons from the state Waimanalo Wastewater Treatment Plant. About 10,000 gallons of untreated waste water spilled from a main that feeds the Kaneohe Pretreatment Facility and entered Kaua Stream, which flows into Kaneohe Bay. The state Department of Health has been notified about both spills. Warning signs are being posted and water samples are being collected. The public is advised to avoid the affected waters. But there was good news in Waikiki. Repairs made to a 42-inch main that burst March 24, discharging 48 million gallons of raw sewage into the Ala Wai Canal, were holding up, said city spokesman Mark Matsunaga. Water samples taken on Thursday indicate bacteria counts along the South Shore are decreasing, and no additional signs were posted, he said. » Hawaiian Telcom spokeswoman Ann Nishida said phone service was knocked out in parts of East Honolulu, including Kaimuki, Manoa and Koko Head. » Hawaiian Electric Co. reported two temporary outages affecting nearly 3,000 customers in Waialae and Waikiki. 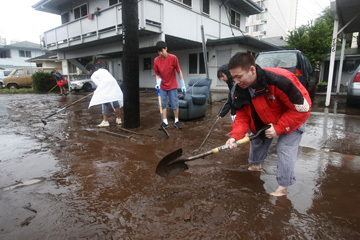 It was a sea of mud on Punahou Street near Fern Street as residents Lillian Shimura, her brother Daniel Shimura, Miyoko Kina and her husband, Bryan Kina, shoveled mud that collected along the street curb to let the mud flow from their homes. Star-Bulletin reporters Debra Barayuga, Leila Fujimori, Craig Gima, Rod Antone, June Watanabe, Gregg Kakesako and B.J. Reyes contributed to this report.